or: The movie without a right arm. 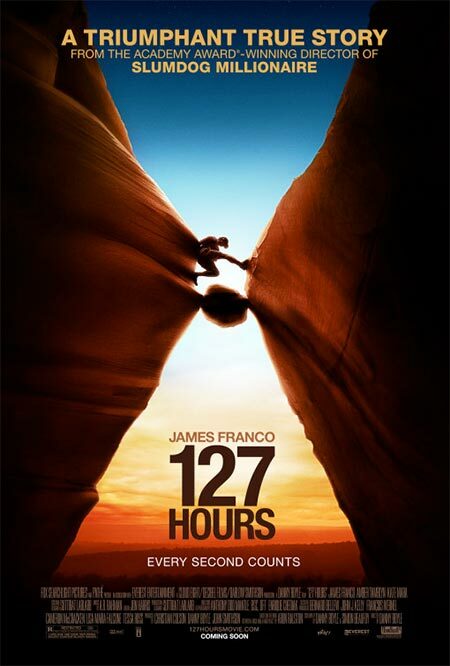 127 Hours had a lot riding on it to get my approval. Firstly, I've been waiting FOREVER to finally see this movie, considering it came out 14 weeks ago in America and we have just got it. Then there's the fact that Danny Boyle never fails to impress me, so I wasn't willing to admit defeat here, especially because the trailer made it look jam-packed full of great visuals and colour. And there's the little bit of hype surrounding the now famous amputation scene...more on that later. To those who doubted that this would get its place among this years Oscar nominees, you were very wrong. This is one of my favourite films to get nominated this year. The story is pretty well known. 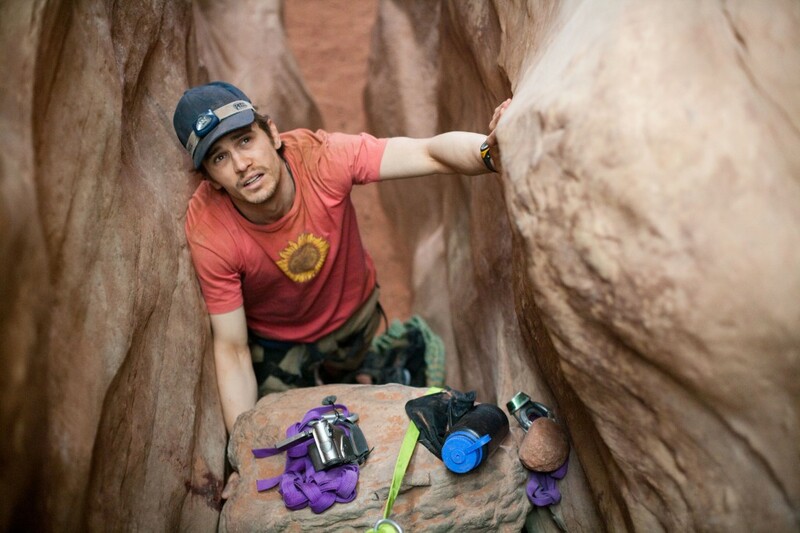 Based on Aron Ralston's autobiography 'Between a Rock and a Hard Place', this tells the story of Aron's (James Franco) plight to survive. On a hiking trip, Aron finds himself with his arm crushed and trapped by a boulder in an isolated canyon in Utah. With limited food and water, Aron starts to think of possible ways he could get himself out, all the while recalling past experiences which have shaped him as a person: mainly including his regrets. As Aron slowly deteriorates, he begins an unthinkable task to ensure his survival. A whole movie based on a guy stuck in a canyon could have been a tedious journey. However, from the get go, when we see Aron getting ready for his big trip, Danny Boyle uses multiple split screens not only to add more visual goodness, but to give us a small reminder of what we are in for: a hyper adrenaline junkie type film. From there on this movie moves quickly, but surprisingly, the memories don't run this movie over. The film never strays far away from its awful predicament. While being stuck in a small place couldn't possibly be the most interesting idea for a movie, screenwriters Boyle and Simon Beaufoy give us plenty to chew on. They bring you right into the story, and with the aid of brilliant direction from Boyle and an ambient score from A. R. Rahman, you can feel every prick of pain and the urge to survive. And they also give you a very good moral: always tell someone where you are going. All the time. James Franco had a big job in this movie. For 80% of the film, all we see is James Franco, on his own. The other 20% of the time we have people coming in and out of the story, who are easily outshone by Franco's brilliant star performance. Had this been given to any less likable than Franco, it would have fallen flat on its face. I'll admit, had Boyle's first choice Cillian Murphy gone with the role, it probably wouldn't have been as good. James Franco makes this movie. If only he could win the Oscar this year. The editing in this movie is another strong point. There must be a million different angles used to make the prospect of claustrophobia in the canyon a lot scarier than it should have been on film. But the best editing is used in the amputation scene. There are terrific cuts which explode within the scene which is ten times more horrible than any movie that is intentionally sadistic, i.e. Saw (+7). I wouldn't call myself an expert on gore, but I generally felt sick after that scene. Which made the ending all the more sweet. In fact, this movie was life changing for me. I appreciate water a lot more now. THE VERDICT: 127 Hours is a visceral and intense drama with the typical Danny Boyle flair that we know and love. 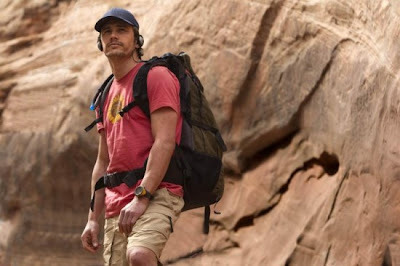 James Franco is simply amazing acting (for the majority) by himself, and truly makes this film the uplifting hit it is. It is life-changing, isn't it? This year's films have been brilliant- TSN, 127Hours, Inception, Toy Story 3, Black Swan- I'd love to see them win things. If only TKS didn't get all the unnecessary attention. I mean they called that performance-driven, but Franco carried this whole film off alone. And the editting is just mind-blowing. My absolute favourite scenes are when the title of the film first appears and it's like BAAAM! and the "Oops" scene. The arm-cutting scene was very good too. Really sensational performance from James Franco, and such an energizing use of visionary techniques. Boyle managed to squeeze so much into what could have been so little. Should be a bigger factor in the Oscar ceremony than it is likely to be! Great review! I'm really surprised at how long it takes for films to make their way down to New Zealand, I had no idea it could take so long! I look forward to watching this one though, it seems great, I just hope the amputation scene isn't to gory for me to put up with. Thanks everyone! Should be more popular at the awards shows, shouldn't it? It isn't that gory...and that was one of the best parts of the film. It's scary though...that's what Boyle does, we feel it much more than we see it. Oh you must must watch Never Let Me Go. It's so beautiful and it's very sad that it got zero-award recognition. Films don't release in UAE either (Black Swan was banned).